We often consider tomato sauce a job for the stovetop, expecting a slow burble in a saucepan. But Rachel Strecher—via Canal House—has shared a method on our (Not)Recipes app for passing that work onto your oven—and your dinner guests or family members. Along the way, you'll give the "sauce" some additional flavor and texture, too. Here, you roast tomatoes in the oven, then make the sauce in the individual bowls. Another stunner from the #canalhouse ladies. Scoop out most of the guts of some nice tomatoes, insert bits of garlic into the cavities and toss with breadcrumbs that you sautéed in plenty of olive oil, salt and melted anchovies. I believe the original recipe used pancetta too, but it's fine without it. Add chopped herbs to the bread crumb mixture. Bake at 350 until almost collapsing. 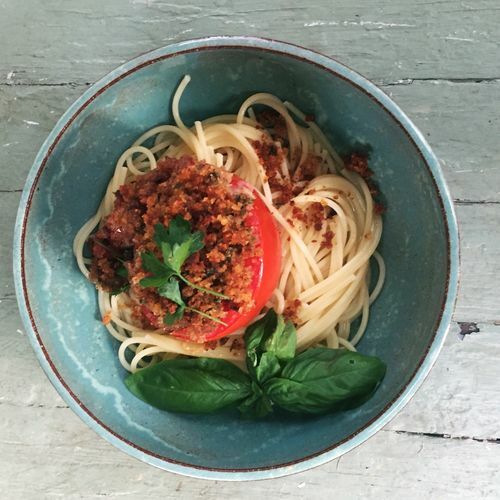 Instead of making stovetop sauce, hollow out good tomatoes and fill them with breadcrumbs that have been toasted in olive oil and anchovies (you can add pancetta, too) and mixed with herbs. Then, bake at 350° F for about an hour, until collapsing. When the tomatoes are almost at that point, boil spaghetti, saving 1/2 cup of water. Take the baking dish out of the oven, spoon all of the oily, tomato juices that have pooled at the bottom onto the pasta, and pour in the reserved pasta water (starch becomes creaminess). Toss together, then distribute the noodles among bowls and plop tomatoes on top. As you slice, you'll get sauce! Find a write-up of that Canal House recipe here or in Canal House Cooking. My mom use to stuff tomatoes with a ground pork and onion mixture. Fried it up, or baked it, then doused it a good soy sauce. Served with hot rice. Easy dinner in about 45 mins. It even tasteds good with those flavorless winter supermarket tomatoes. Well this sounds good, I think I'll try it when my fresh tomatoes ripen.